Spent a good part of yesterday cutting out and sewing Barbie dresses. I do love making fancy Barbie outfits. HOWEVER, my serger gave me a fit. I had to change the thread - hate doing that - and in the process, one thread broke which messed up the entire thing. I messed with that darned thing for over an hour and never did get it to doing what it's supposed to do. Finally left it and went with Plan B on the dress I was working on. Thought maybe if I left it for a couple of days and then went back and started fresh re-threading and adjusting it would work. Maybe I was making a mistake and kept doing the same thing over and over. Anyway, I'm REALLY frustrated with it. That dress turned out quite different than what I'd first envisioned though. You know, if you goof on one it's not normally a throw away, you just figure out another plan. This one wound up being a two pieced elegant gown. Not your typical elegant Barbie gown, but seeing some of the Hollywood stars and what they wear on the red carpets these days, it's right in style. I'll get a pic of it soon, too tired last night when I finished it. My bottom is tired of sitting in this chair. Get started on a project though, and it's difficult to walk away from it. I've worked on facebook and a logo for a friend ALL day. Well, all day except for the time I spent sitting out on the front porch petting the two new KITTIES who have showed up at my house. Here they are relaxing with full tummies. This is Boots (yeah, we've already named it). He/she (I can't be sure) is the shy one and really scary. I've already got it to let me pet it if I walk up to it slowly. This picture was made with it sitting right next to me. Of course, I'm drawn to this one because it's so shy. Like I really need another cat. The grandkids haven't been able to come up with an acceptable name for this one. It's all black with a touch of white on it's chest and way back on it's tummy. VERY friendly. These little cuties were starving - about 2-3 months old and so cute. Here he (I think this one is a he - but again not sure) laying down - you can see the bit of white. I don't need more kitties! I don't want to be the "old cat lady". Why do these keep appearing on my front porch??? My cats inside are having a fit. Laura's Kitty (a grown orange and white one that showed up about a week ago that I've hopefully convinced Laura - a friend from church) to take).... isn't particularly pleased either. And Halloween (my barn/back desk kitty) won't even come to the front porch with all these interlopers here. But sometimes those are nice. Actually, there are only a couple of us who do cross stitch. One crochets and/or quilts, one does needlepoint, one does embroidery, and one of the younger gals (who doesn't come all the time) just comes for the fellowship. We always have goodies - unfortunately, our main/best cook was out of town today, so we had to make do with store bought, except for some pretty good dip one lady brought. It's a great time to just relax and fellowship. And, it makes me sit down and relax for an entire afternoon. Frosty LOVES Stitch the Group ladies and knows exactly when it's time for me to put the coffee on. He begs for treats shamelessly, and is always rewarded with some. ...the new website Iris Originals - takes awhile for me to think of everything that needs to be done, links on other sites changed, etc. But, for the most part, I believe it's okay. I'm pleased with the look. It's lovely and cool in Alabama - has been for several days - thought it was going to return to being July, but not yet. I love it! There will be plenty of hot left I'm sure. Well, I got a bug in my bonnet for a new website - really needed an 'umbrella' site as my list is growing steadly. Someone asks me for my website and I can't very well spout off half dozen names. SO... Iris Originals is here and live - or will be when GoDaddy figures out I'm not forwarding the name to my Etsy shop anymore. Oh, I still have the Etsy shop, it's one the links on the new site. Actually, I got started thinking about this because my grandson asked me to advertise in their football program - and again, I didn't want to list 6 or 7 websites. Of course, once I got the idea in my head, I couldn't just wait till I actually had the time to work on it (of course, it might never have gotten done if I'd done that). Actually, I'm still tweaking, but "I" really like the look. Check it out and let me know what you think. I've been fighting with facebook all day long. Finally got a business page set up, but had great difficulty getting it to do what I wanted it to do, or see what I wanted to see (though I must admit, part of that was my fault). I should have walked away sooner. But, it's there and I'd love for YOU to become a fan (box on the right). Went to a local volunteer fire department open house this afternoon. I do their website and they are the owners of a brand spanking new truck (from a Grant), so they were anxious to show it off. ... the Walmart dishes won't work either. Colors are fine - size is NOT. Good thing I only bought the ones above to test. They'll go back. I cannot believe some idiot designed dishes that will not fit a dishwasher. Am I the only one this is happening to. It seems all the "new" dinner plates are huge. I've finally found a Pfalzgraff pattern with a smaller square dinner plate. The price is actually pretty comparable to the Walmart ones, I just have to pay shipping - not horrendous, but I'm always looking for free shipping when I shop online. Speaking of online shipping. Walmart at least allows you to have an item shipped to the store where you pick it up and shipping is free. Target, on the other hand, charges an arm and leg, no store pickup for them. Not that I was a huge Target fan anyway, but I surely won't be shopping with them now. ... is almost impossible to find. At least red dinnerware that "I" like. Maybe I'm just too picky, or maybe I'm too cheap (or maybe both). I painted my kitchen last year - a light minty green. Chose the color to go with a red garbage can I bought. Added more red accessories and love my red & light green kitchen. I've had the same dinnerware for a hundred years - Pfalzgraff "Village" - and I have enough of it to feed Guntersville. But, I'm sick of it - and it does nothing for my lovely kitchen. My DIL gave me two really pretty little bowls from a set of dinnerware at Kohls. I love them. However, the dinnerware itself is a bit pricy (for my budget) and the plates are those huge new ones that won't fit in my dishwasher. Why do they make plates too big to fit in dishwashers? Obviously a man designed that. So, I thought - I'll get a solid red and get some of the little bowls as accents. Not nearly as easy as it sounds. I haven't found a red that I can afford and like at the same time. I found a set at WalMart that I could live with, though the red is a bit darker. There's also a green - which is also a big darker, but they would probably work. However, the plates are square - and I'm not a big fan of square plates. We visited "Old Time Pottery" in Madison today - thinking they might have something red, and I actually found a starter set that I liked and was willing to pay for. However, they only had ONE, and service for four at my house just doesn't cut it. I've wasted waay too much time searching online. 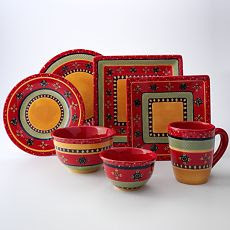 Found the pottery set online, but shipping was as much as the dinnerware - so not going there. .... and I missed them. I'd definitely gotten used to living alone before they came, but with 4 our of 5 gone for several days (and the one left home is the quiet one), I missed them. I wasn't lonely - I'm fine alone - but I did miss them. Off to work today - nothing exciting happening. ....at least that's what my grandson thinks. My son & his family are staying with me till they can get their house situated. Son, his wife, oldest grandson and granddaughter are at a Pastor's conference (they've been gone since early Monday morning). Middle son (15) is home with me since he has both football and basketball practice. He just decided I haven't been eating enough in his parents absence and he's very concerned about me. Now, I've lived alone since my DH died in 2005. I've taken care of myself, survived breast cancer and fed myself. I haven't always eaten on a regular schedule and almost never cook anymore (did I mention, I hate to cook). However, I've managed so far. But, he's concerned that I haven't had enough protein (and I probably haven't, but I'm not telling him that). I suspect his mother (my sweet DIL) told him to keep an eye on me and make sure I eat enough as she's always concerned about my eating habits. It's really sweet that he's concerned. He offered to cook me some eggs so I could have protein. I don't really want eggs, I don't really want food right now. I do appreciate his concern, but I've decided my kids and grandkids are getting awfully pushy in my old age. .... and I had a lovely Independance Day Holiday weekend. My oldest son came down from St. Louis and spent 3 days with me - mostly working outside (I usually have a list for him), but visiting a bit more since he had a brother and two nephews who could help with the big outside projects. They got a bunch of fence taken up that I wanted gone, and the gutters cleaned trash and little trees that were growing there. Unfortunately his family didn't get to come this time - short trip and grandson was headed to scout camp on Sunday. DIL who's living here cooked us a great Independance Day dinner (with the help of oldest grandson). Fried fish, hush puppies, french fries, fresh tomatoes, cucumbers, and avocados. I ate waay too much. One son and granddaughter went down the mountain to see fireworks on the lake. I stayed home and visited with out of town son. She was going to fix blackberry cobbler for dessert but we were all way too full, so she made it yesterday afternoon instead. Hot from the oven, topped with Blue Bell vanilla ice cream. It just doesn't get any better than that. The only thing that would have made the weekend any better would have been having the balance of my family here - but I just appreciate those that were here. I woke up this morning thinking of all the things we have to be thankful for in America. Yeah - we moan and groan and complain - but in reality, we have it pretty good. That said - we should never take our freedoms for granted. We've lost many of of our freedoms - and probably will lose more as our country caters to the minority instead of the majority. 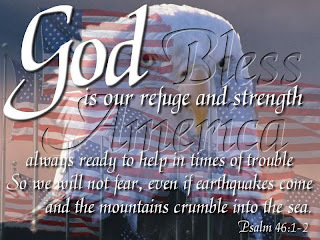 Another good reminder - our great country was founded on Christian principals and our forefathers weren't ashamed to be known to be Christians. I hope I can follow their example. ... and it shrinks every day. I've been online friends with a sweet lady in England (Jayne)for a good number of years. She sells lovely vintage type stuff online shop. A couple of days ago she posted on her blog about selling a selection of vintage china cups & saucers to a lady in the USA as she was planning a tea party for her sweet daughter's 3rd birthday. The nice lady (Tammy) had sent Jayne some photos and given her permission to post them on her blog. I read Jayne's blog faithfully so I saw the absolutely adorable photos of a little girl's dress up tea party, and posted a comment. Now, this tea party reminded me of little girls of long ago - you need to go and see the photos if you haven't already - and those little girls look like they're having so much fun. Okay, I'm finally getting to the reason for it being such a small world. I got an email from Tammy this morning (she saw my comment on Jayne's blog) and she (Tammy) only lives about 40 miles from me (here in north Alabama) and her parents (he was the butler) are only about 30 miles. She said the girls had a great time and particularly seemed to enjoy being waited on by a grown up butler (Tammy's step-dad who also had a great time), and stayed at the tables longer than expected. Yes, it IS a small world!!! ... or it seems so anyway. I'm used to going to work on most Wednesdays and while I have PLENTY to do around here, I've kinda been at loose ends because my week is now totally different. Not complaining - it's been kinda nice getting caught up on some 'desk stuff' and doing some online researching that I've been wanting to do. It's just strange for me. Ariel seems to be feeling better - enough to complain about being bored. Her Dad told her she should have been sick when he was a little boy - 3 snowy TV channels with soap operas in the afternoon and poor quality AC. Then he said she was really lucky she wasn't sick when Gram (that's me) was a little girl - we just lay in the bed and sweated (actually, that's a pretty close description). Ariel wasn't impressed. I'm still having a bit of a sore throat, though it may well be sinus. I'm taking the preventive meds and staying away from the rest of the family.